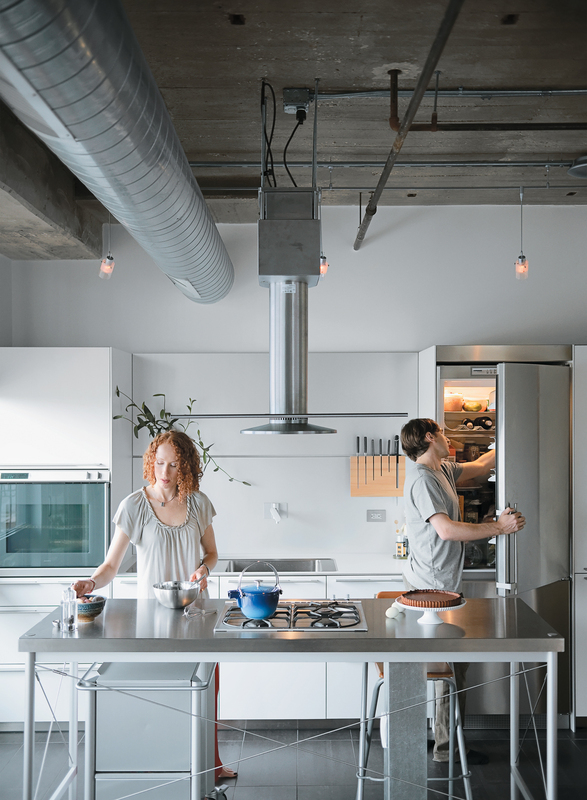 When these full-time foodies renovated their Chicago condo, getting the kitchen right meant finding the right kitchen island. Editor-in-chief Sam Grawe invites himself over to sample the fruits of their labor. Chelsea and Arthur Jackson renovated their fourth-floor condominium to include a custom Bulthaup kitchen. At breakfast, Arthur multitasks while seated at the dining table. He hand-stenciled the pattern on the wall in the background. Arthur created the fresh pumpkin salad based on farmers’ market finds. Reflected in the Bulthaup System 20’s gleaming stainless steel surface, Chelsea uses a pastry bag to pipe the marshmallow kisses onto her s’mores tart. Arthur carved the Indiana limestone–clad bar out of an awkward space in the hallway. Pork Chop, the dog, has plenty of comfortable places to nap between meals. With SOM’s Willis Tower looming in the background, a double-decker Metra train passes by the University Station building, a former produce storage facility in Chicago’s Pilsen neighborhood. Arthur slices the goat ribs before applying a fresh pesto made with herbs from the balcony. In the adjacent bedroom, decorative touches like the silver wallpaper and mirrored regency-style side table juxtapose with the exposed concrete and duct work. The combination living, kitchen, and dining area hosts a Modernica Case Study day bed, an Eames Aluminum Group chair and ottoman from Chicago vintage retailer Pegboard Modern, Artemide’s Tolomeo Mega floor lamp, and a Big Sur Small dining table from Crate and Barrel. The Duetto sideboard and cocktail table were hand-built by designer Sandra Capasso for her thesis project. Among other things, the couple’s refrigerator contains garlic scapes, Meyer lemon preserves, Araucana chicken eggs from Chelsea’s grandfather’s farm, juneberry jam, fresh El Popo tortillas, a ginger beer starter, pickled sour cherries (used in the salad), Tortuga hot sauce, Sriracha, homemade chili relish, and a kombucha mushroom. 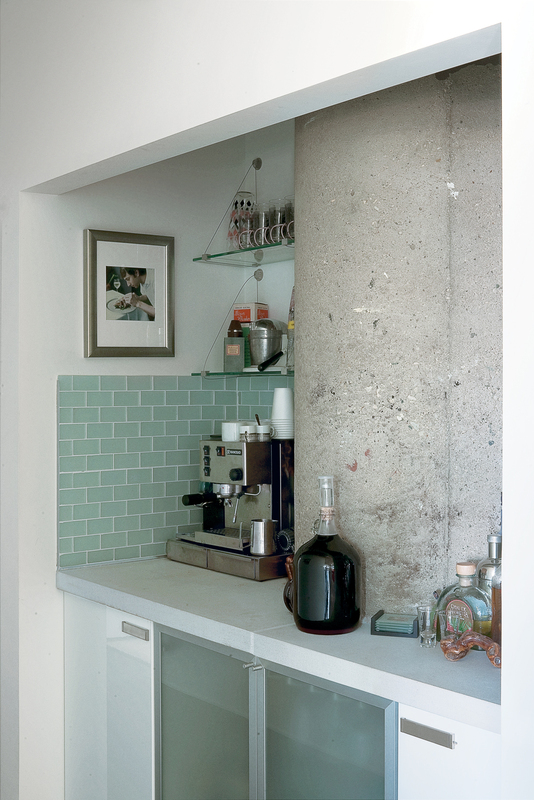 Arthur installed shelving from Ikea and poured a cast-in-place concrete shelf to create a small media nook. The road dips down between two large sets of overhead railroad tracks and my African cab driver slows down and pulls up to the curb. As the sounds of his high-life guitar riffs fade into the evening air, I’m left to gape upward at the hulking cold storage facility turned condo building I’ve come to visit. For the past few days—on this, my first trip to Chicago—I have done a lot of gaping. The city continually harnesses your gaze along its strict axes—just as often skyward as outward to the ever-distant horizon. city constantly reminds you that it is the cornerstone of American building. But in my mind, the architecture alone isn’t what makes Chicago the archetypal U.S. city—scattered amidst those behemoths of American achievement is a diverse array of neighborhoods, each brimming with old-world pride and new-world possibility. This evening I find myself in Chicago’s Lower West Side in a neighborhood dubbed Pilsen by the Czechs who settled there in the late 19th century. As a testament to the shifting sands of American immigration, today Mexicans, who have transformed the corridors of 18th and 26th streets into vibrant, busy districts, largely inhabit the area. The street food vendors, lively markets, and inexpensive restaurants were part of the attraction for Chelsea and Arthur Jackson, who moved here in 2006. They were also wooed by a condominium in a former produce depot between the railroad tracks that was affordable and conveniently situated just minutes away from their respective workplaces. Chelsea works as the editorial director for university publications just a few blocks south on Mies’s iconic Illinois Institute of Technology campus. Arthur is the chef at Bijan’s Bistro, a popular restaurant that serves tasty, unfussy American fare to loyal customers 365 days a year. Tonight, however, the pair has graciously agreed to serve as my hosts for dinner. I head through the seemingly endless interior hallway to the westernmost unit on the fourth floor, where I’m greeted by a tawny flash of fur that goes by the name of Pork Chop, followed close behind by the Jacksons. If naming a dog Pork Chop is any indication, the couple is really, really into food. Chelsea may be an editor by day, but she’s also a certified pastry chef with a serious baking habit. Arthur leaves behind at work whatever limitations are imposed by sticking to a standard menu. As I soon learn, the pair has transformed their abode into a striking laboratory for culinary exploration. The couple’s enthusiasm for foodstuffs is rivaled only, perhaps, by their fondness for modern design. They purchased their condo with a standard build-out but immediately found it unsatisfactory. “I asked Chelsea how much drywall dust she would be willing to live with, and if she would be all right with washing dishes in the bathroom,” recalls Arthur, “and then started the demo right away.” Despite lacking prior experience, he was confident he could tackle the job himself. His father, a bricklayer who built two of their family homes, and his brothers offered tactical and practical support. Swapping out the rotisserie attachments and replacing the goat rack with a small dish of soon-to-be-roasted hen-of-the-woods mushrooms, Arthur explains how the first order of renovation business was to get rid of the existing floors and kitchen. The combined kitchen and living area was cramped, and a bulky shoulder-height wall between cooking and seating areas didn’t help matters. “We wanted to find a kitchen island that would be light enough to make the room seem large while still standing up to heavy-duty cooking,” Chelsea notes. Calls to kitchen retailers were fruitless until Arthur reached the Bulthaup showroom, where the staff suggested he come check out a floor model of the discontinued System 20 kitchen. The stainless steel island, with its precise profile and gas cooktop, was exactly what the couple was after, and they bought it on the spot. A full Bulthaup kitchen—completed with components from the B3 range—would soon become the centerpiece of their new home. 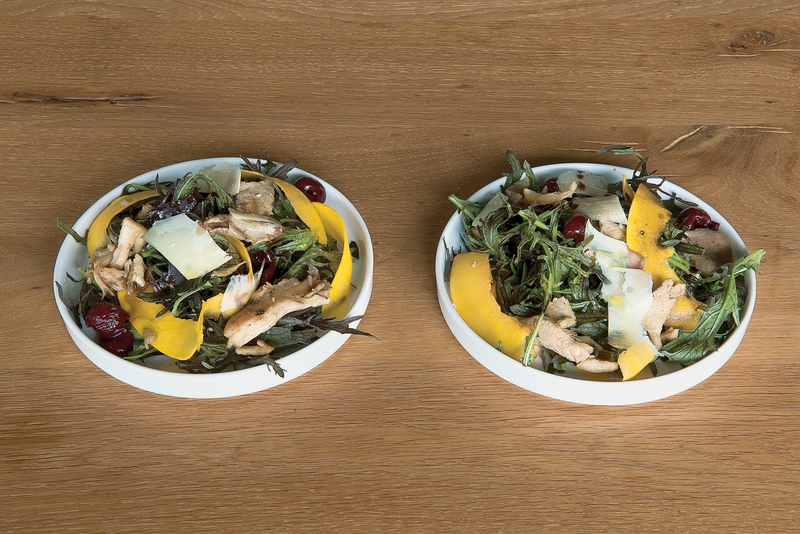 As Arthur attends to the next course, a salad of the aforementioned mushrooms, mustard greens, pickled sour cherries, Parmesan, and shaved fresh pumpkin, I contemplate the movements of the pair as they maneuver in their space. The scene is oddly reminiscent of a highly choreographed action sequence, where contact is threatened but always narrowly avoided. The galley space is tight, but some clever decisions regarding placement of key items keep Chelsea and Arthur out of each other’s way as they prep, cook, and clean up. Over the meal, Arthur explains how eventually the pair worked their way through the condo project by project, room by room. An awkward corner carved out of the living area offered the perfect location to try a hand at cast-in-place concrete. The nook is now a media center, with shelves for cookbooks and a ventilated cabinet for the hi-fi and computer. In the hallway bathroom, hex tiles, marble, and a fuchsia wall came together to create a space worthy of a boutique hotel. Throughout the apartment, small personal touches, like a neatly arranged shelf of curios and a hand-stenciled wall pattern, show the couple’s dedication to making the most of their small home. 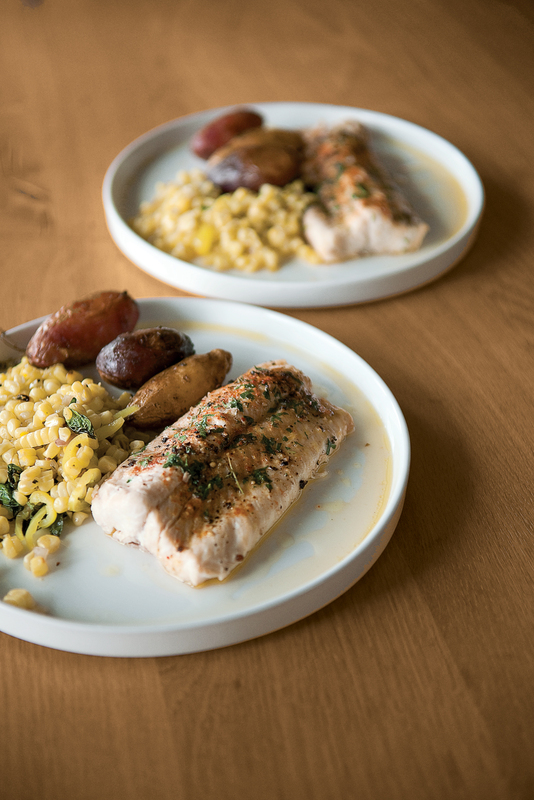 After a main course of foil packet–grilled Lake Superior whitefish served with piment d’Espelette and assorted fingerling potatoes, dessert presents Chelsea with an opportunity to shine. She fires up a blowtorch and puts the final roast on the marshmallow topping of a s’mores tart. “This afternoon we smoked it on the grill to give it a little campfire flavor,” she says. As we make our way through the rich treat, I can tell she is already thinking about what she would do differently the next time. It is precisely this willingness to experiment that gives their home its defining characteristic. Perhaps a lifetime spent working with recipes prepared them both well for renovation: First master the fundamentals, and then add your own spin.